Brisbane really is blessed with a vast array of kid's playgrounds (in fact there are 1012 according to Brisbane City Council) and they are all unique and fun for different age groups. Over the years, our family have visited hundreds of these playgrounds and some of our family favorites include the very popular New Farm Park and the spacious Kidspace at Chermside. Do you have a favorite kid's playground, even if it's a tiny little one? This is a hard call as we are spoilt for choice in Brisbane with glorious weather and wonderful parks. Our current favourite is Hidden World at Taigum. I totally agree - Hidden World is definitely in our top ten too. I love the make-believe play space at Minnippi Parklands. There is a stone 'Icaroplane' (an airplane with birds wings and a woman's head) to fly, a mystical fairy table, magic colourful eggs under the trees and a rocket ship tower to climb. It's unlike any other playground we've been to. 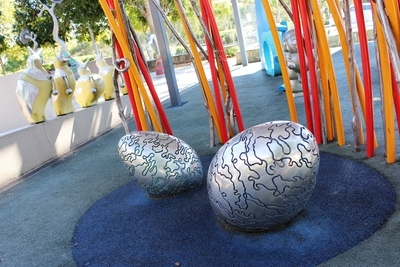 There are also good kids playgrounds, which are close to the city centre at Southbank (conveniently located next to the swimming area) and Roma Street Parklands (be sure to visit Colin Campbell Place while you're there). An oldie but a goodie - New Farm Park. We love playing around the roots of the giant fig tree at New Farm Park too. I don't know if this is the best one, but the 7th Brigade Park in Chermside has a monster play fort. Oh, to be young again, or would they stare at me if I played on it.